I was cruising through some blogs this morning when I ran across a post that I totally identified with! He noted that Rugby shirts are his go-to fall/winter styles. His post immediately got me thinking of my closet and all of the "I like it so much, I'll buy one of every color" shirts, sweaters, pants, etc. 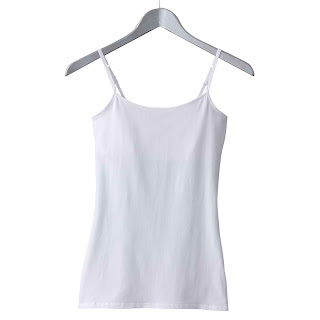 But there is one piece of clothing that I can NEVER have too many of...Camisoles! This is my favorite kind by far...it's from the junior department of Kohl's. I know what you are thinking, I'm totally not a "junior" but I just like the fit better than the ones in the women's department! I wear these almost every day! I have had every color possible at one time or another, including black, white, blue and brown. Notice all the white ones in the stack? I have an equal number of black ones but they are currently awaiting their turn in the washer! Do you have multiples of a certain type of clothing? Head over to Life Through Preppy Glasses and join in the party! Thanks for linking up!! Great choice...you wouldn't be able to wear a lot of your wardrobe without them... Essential right?